We all know the blogsphere can get messy sometimes. And celebrities know this all too well. Celebrities are usually immune to these rumors and stories. They kinda learn to brush them off. However sometimes they cannot just let some stories slide. Bien, of Sauti Sol in a Facebook post yesterday called out Liatema Munyu of Ghafla for writing a story about ‘disposable members’ of some of the top Kenyan groups. They are arguably Kenya’s greatest ever musical act reaching heights few individuals or music groups can ever come close to match. They are made up of four members, Bien Aime, the lead singer, the main man and an accomplished song writer, Willis Chimano, a vocalist multiple instrument player and the group’s rock star, Savara Mudigi, the brains behind their label Sauti Sol entertainment, producer , vocalist and percussionist extraordinaire and the Polycarp Otieno, the group’s quiet guy, a good producer and guitarist. When he is not used as an actor you will be hard pressed to find any significant contribution to the groups music he makes. Savara is obviously the bigger influence on the music production while a guitarist can always be found at a moment’s asking. So Polycarp Otieno is just a guy who was at the right place at the right time. Now check out Bien’s response to what she wrote above. You stupid journalist. You should research before you write these articles. Then again I forget blogs like these only hire the bottom of the pyramid of journalists to write. 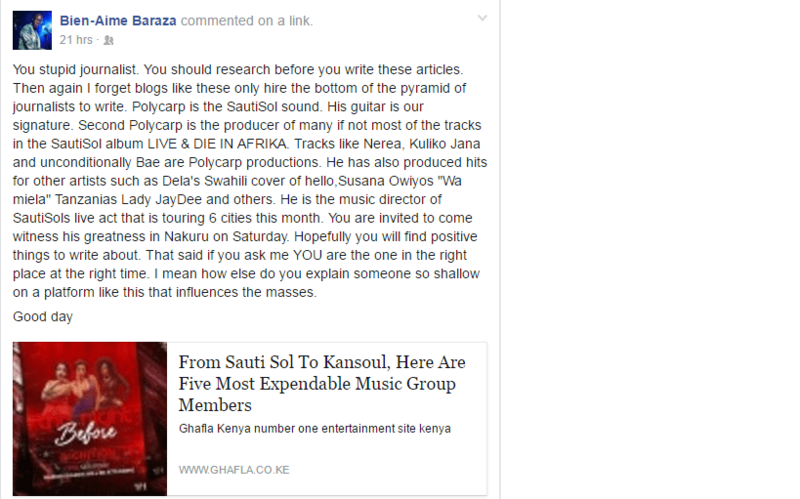 Polycarp is the SautiSol sound. His guitar is our signature. Second Polycarp is the producer of many if not most of the tracks in the SautiSol album LIVE & DIE IN AFRIKA. Tracks like Nerea, Kuliko Jana and unconditionally Bae are Polycarp productions. He has also produced hits for other artists such as Dela’s Swahili cover of hello,Susana Owiyos “Wa miela” Tanzanias Lady JayDee and others. He is the music director of SautiSols live act that is touring 6 cities this month. 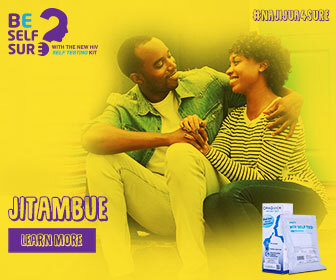 You are invited to come witness his greatness in Nakuru on Saturday. Hopefully you will find positive things to write about. That said if you ask me YOU are the one in the right place at the right time. I mean how else do you explain someone so shallow on a platform like this that influences the masses. Well, let’s just say that Bien clearly shut down the writer. Next articleDid Willy Paul just leak his collabo with Sauti Sol? Zari Hassan robbed: Celebs stop flaunting your riches!